If you ever experience mold inside of your home or business, it’s important for you to do everything you can to get rid of it as soon as possible. Mold can spread very quickly, and when it does, it can cause serious health problems for some people and damage property in the process. Therefore, you will want to call on a company that specializes in mold removal or mold remediation to come out and take care of your mold issue. Mold removal and mold remediation are essentially the same thing, so don’t get confused if a company starts using them interchangeably. The only real difference between the two is that mold removal usually refers to, as its name would suggest, physically removing mold from a home or business, while mold remediation refers to the entire process of inspecting the mold, removing it, and then finding the cause of it and eliminating that as well. If you only worry about removing mold from your home or business without fixing the larger issue, the mold is likely to come back. Therefore, it’s important to have mold remediation done to see to it that the mold doesn’t return. 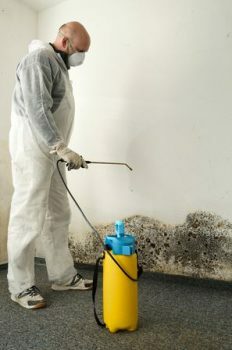 A qualified mold remediation company should take a number of steps when dealing with the mold in your home or business. They should test the mold as well as the air quality in your home. They should also act with a sense of urgency when it comes to removing the mold. Moreover, they should identify the root of the problem and work with you to get it fixed quickly. Rapid Response Restoration can do all of these things for you and put your mind at ease if you’re ever forced to deal with mold. It can be a scary situation, but we will walk you through the mold remediation process and ensure that we get rid of your mold problem. Schedule an appointment with one of our mold experts by calling 602-466-2619 today. Please fill out the form below with any general questions you may have regarding our services, and we will get back to you as soon as possible. © 2019 Rapid Response Restoration.